Majuli or Majoli is a large river island in the Brahmaputra river, in the Indian state of Assam. 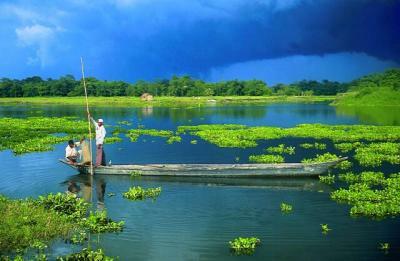 Majuli is the largest river island in India. (the largest river island in the world is Bananal Island in Brazil). It is situated in the upper reaches of the river Brahmaputra in Assam within the latitude of 26045' N - 27012' N & longitude of 93039' E - 94035' E with mean height of 84.5 Mt. above MSL. Majuli had a total area of 1,250 square kilometres (483 sq mi), but having lost significantly to erosion it has an area of only 421.65 square kilometres (163 sq mi) in 2001. With a population of 1.6 Lakhs, majority being tribals, has a very rich heritage and has been the abode of Assamese Vashnavite culture with tremendous option for spiritual and Eco-tourism. The island is formed by the Brahmaputra river in the south and the Kherkutia Xuti, an anabranch of the Brahmaputra, joined by the Subansiri River in the north. The island is about 200 kilometres east from the state's largest city — Guwahati, and is accessible by ferries from the town of Jorhat. The island was formed due to course changes by the river Brahmaputra and its tributaries, mainly the Lohit. Majoli is also the abode of the Assamese neo-Vaisnavite culture. Originally, the island was a narrow and long piece of land called Majoli (land in the middle of two parallel rivers) that had Brahmaputra flowing in the north and the Burhidihing flowing in the south, till they met at Lakhu. Frequent earthquakes in the period 1661–1696 set the stage for a catastrophic flood in 1750 that continued for 15 days, which is mentioned in historical texts and reflected in folklore. As a result of this flood, the Brahmaputra split into two anabranches—one flowing along the original channel and the other flowing along the Burhidihing channel and the Majuli island was formed. The Burhidihing's point of confluence moved 190 km east and the southern channel which was the Burhidihing became the Burhi Xuti. The northern channel, which was previously the Brahmaputra, became the Luit Xuti. In due course, the flow in the Luit Xuti decreased, and it came to be known as the Kherkutia Xuti; and the Burhi Xuti expanded via erosion to become the main Brahmaputra river. There are several Satras of Vaishnava religious creed. Of these holy seats, Auniati, Daksinpath, Garamur and Kamlabari are the four most prominent. What is of special importance is its satra establishment, consisting of separate structures, built for different purposes. The Vaishnava Satras were founded by Sankardeva, the father of Assamese culture. The historic and auspicious 'Manikanchan Sanjog' was the first Satra in Majuli. Subsequently 65 satras grew which propagated the ethnic and sociocultural ideals. At present there are only 22 Satras in Majuli and rest have been shifted to other safer places due to flood and erosion. These Satras are the treasure house of 'Borgeet', Matiakhara, Jumora dance, Chali dance, Noyua dance, Nande Vringee, Sutradhar, Ozapali, Apsara dance, Satria Krishna dance, Dasavater dance etc. which were contributed by Shri Sankardeva. The main industry is agriculture, with paddy being the chief crop. Majuli has a rich and diverse agricultural tradition, with as many as a hundred different varieties of rice grown, all grown without pesticides or artificial fertilisers. Among the fascinating arrays of rice produced are the Komal Saul, a unique type of rice that can be eaten just after immersing the grains in warm water for fifteen minutes, and usually eaten as a breakfast cereal; the bao dhan, that grows under water, and is harvested after ten months and the Bora saul, a sticky brown rice used to make the traditional cake known as pitha,. Fishing, dairying, pottery, handloom and boat-making are other important economic activities. Handloom is a major occupation among the distaff population of the villages. Although largely a non-commercial occupation, it keeps many of the inhabitants occupied. Weaving is exquisite and intricate with the use of a variety of colours and textures of cotton and silk, especially 'muga' silk..
Majuli has been the cultural capital and the cradle of Assamese civilization for the past five hundred years. The satras set up preserve antiques like weapons, utensils, jewellery and other items of cultural significance. Pottery is made in Majuli from beaten clay and burnt in driftwood fired kilns in the same mode carried out by the peoples of the ancient Harrappan Civilisation. Sociologists have stressed on the preservation of these unique peoples, whose culture and dance forms are untouched by modernism. The handloom work of these tribes is also internationally famous. Virtually every single person on the island is involved in the three-day long raas festival, depicting the life of Krishna. People from hundreds of kilometres away come to celebrate this festival including a number of expatriate members of community. The satras have also honed certain art and craft traditions, which can now be found only here. In Natun Samuguri satra for example, one can still find the craft of mask-making; and in the Kamalabari satra the finest boats are made. Jorhat is well connected by air, with daily flights from Guwahati, and four flights a week from Calcutta. From Guwahati, Jorhat is a seven-hour bus ride. Buses leave early mornings and at nights. From Jorhat it is only fourteen kilometers to Neemati Ghat. There are at least two ferry rides to Majuli every day, one around 10 a.m., the other around 3 p.m. Exact times can be ascertained from the private bus stand at Jorhat, from where buses leave for Neemati. The first ferry ride lasts about an hour - after that transfer to a bus for a ten minute bus ride across Major Sapori, another island en route Majuli. Then a short ferry ride, and yet another bus ride to Kamalabari, the main town on the island. You can also hire a taxi, either from Jorhat or in Majuli. The taxi can cross over on the ferry. Majuli does not have a developed infrastructure for tourism. There are no hotels. Some satras have guestrooms. If you write in advance, they would certainly be available. The Satras that have such facilities and can deal with visitors easily are Natun Kamalabari, Uttar Kamalabari, Auniati, Bhogpur and Dakhinpat. The first two are walking distance from Kamalabari.